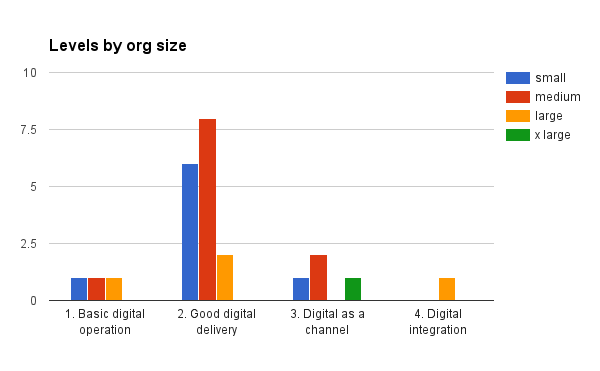 In many sessions with charity Digital Leads we discussed what support they need to help their organisation go up a level in their use of Digital. One of the conclusions has been that Digital Leads, their managers and SMT need tools and evidence to help them make the case for Digital. Often there is an understanding in organisations that something needs to be done about Digital, but there is a lack of clarity about where to start or where to go next. This is how Digital Maturity test came about. This questionnaire works a bit like a personality test – after answering 14 questions you'll get a report stating the level of digital maturity your organisation is at and a prioritised list of next steps that will help the organisation go up a level. None of the organisations that responded are on Level 5 yet. Most non-profits report positive attitude towards Digital, but this attitude is not yet leading to initiation of digital transformation programmes. Many non-profits could be doing a lot more to reap the benefits of embedding Digital into how their organisations deliver their mission. I hope you find all this useful and if you have any feedback or comments, as ever, get in touch! Digital maturity self-assessment has been developed with the generous help of Tim Kitchin of Copper Digital.